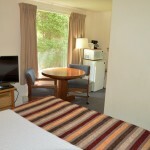 Our small single queen rooms offer comfortable beds, table and chairs and are all on the ground floor. 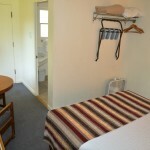 These economical rooms offer a lower cost option for our guests on a budget or just looking for an easy, fast place to stay. Of course, you still have access to the great views by using our common grass area and patio. Room amenities include: refrigerator, microwave, coffee maker and all the amenities you will need for a comfortable stay. We have 4 of these rooms and they are all pet friendly and have hard surface floors.